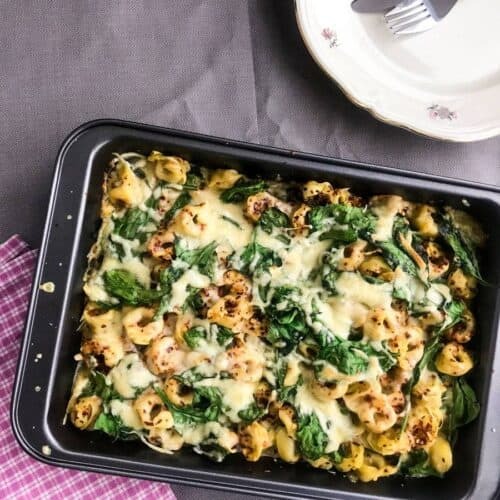 This easy Baked Tortellini Casserole is quick & mainly cooks itself, with very little prep. It’s one of the best weeknight dinners, for those nights when you feel a little indulgent but just can’t be bothered. 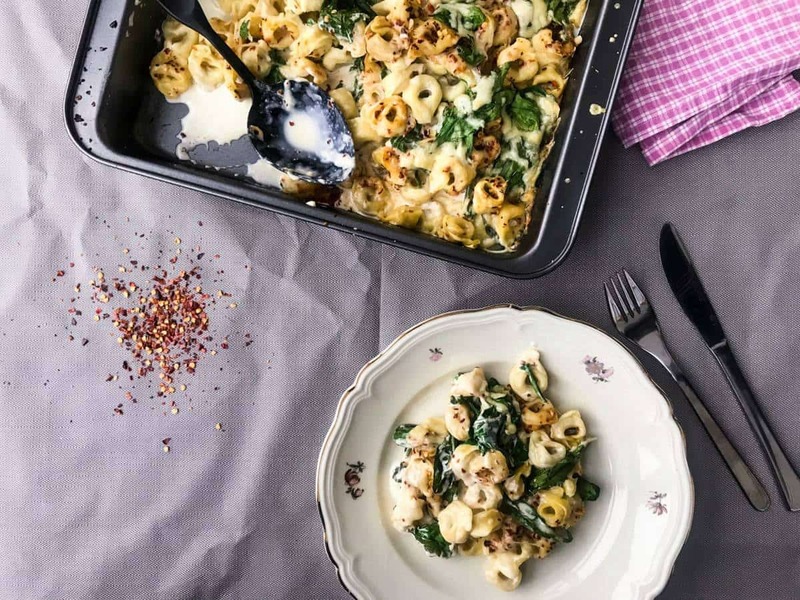 And as an added bonus it’s really easy to make vegetarian – just go for cheese filled tortellini instead. A big part of my college degree could be probably attributed to this specific recipe. I made it almost every week back then, when money was tight (I once had mashed potatoes topped with barbecue seasoning and ketchup for dinner. A low point in my culinary career. Especially as I added too much water to the mashed potatoes so it came out more like a mashed potato soup.) and all food needed to be lunchbox-appropriate. 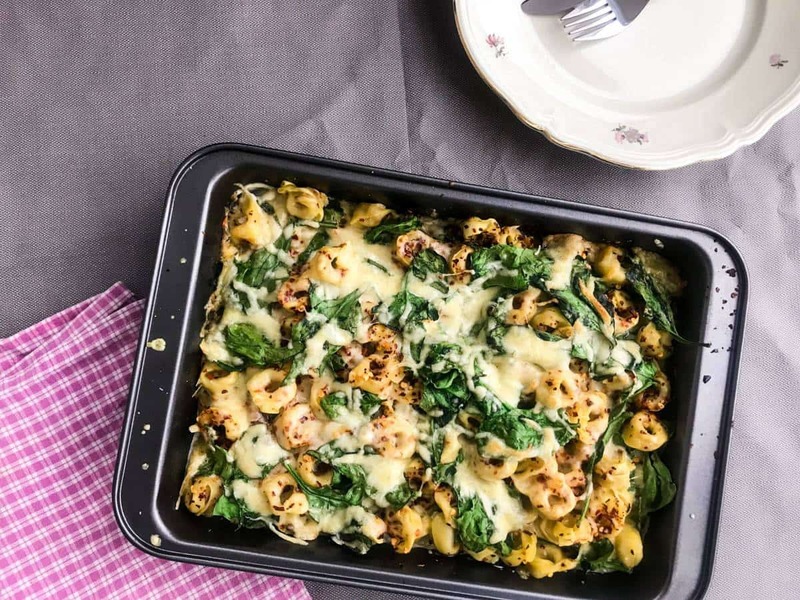 This tortellini casserole fits all the requirements. It’s quick and mainly cooks itself, so it’s perfect for fitting in some studying or working while it’s cooking. It’s cheap, at least along my standards – one portion comes out at €1-2. 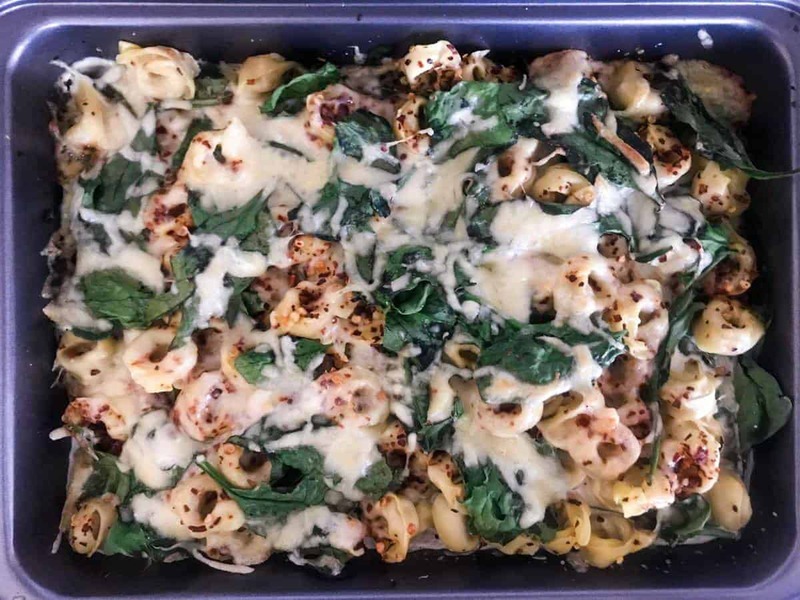 And, it’s perfect for your lunchbox – especially if you cook the tortellini a little bit less so they’re not overcooked after heating up. And, not to mention, it’s tasty & cheesy & comforting and all set to make you happy. Now, on to the easy-peasy cooking part. Start by cooking your tortellini (dried tortellini is best for this) about half the time stated on the package. Drain and place half of them in a non-stick oven pan. No need for butter if using non-stick for this! 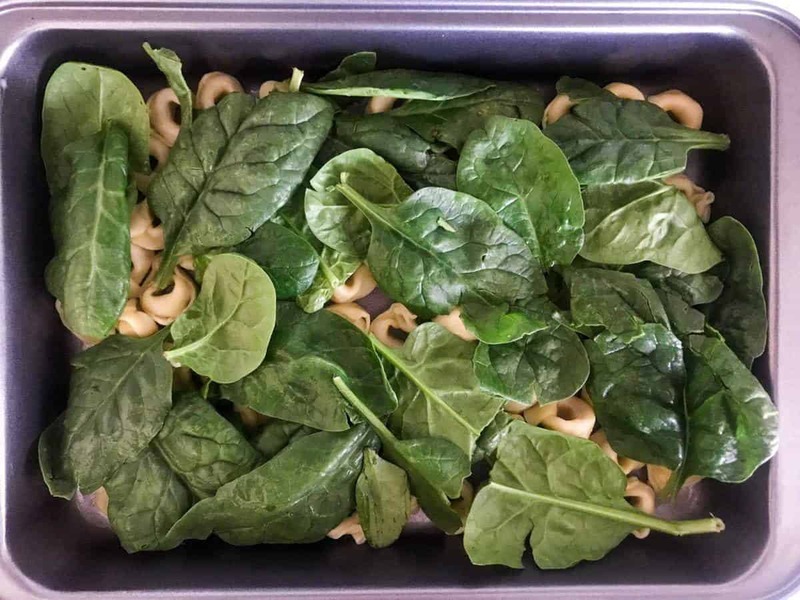 Place half of your spinach on top – don’t go splurging on baby spinach for this, the big grown-up kind will do just as well. Now add half of your cheese. On with the rest of the tortellini and sprinkle with chili flakes. Adjust to your taste, and if you don’t like spice at all then just add your seasoning of choice instead. But don’t skimp! A lot is good. Pour over the cream, and stick it in the oven. 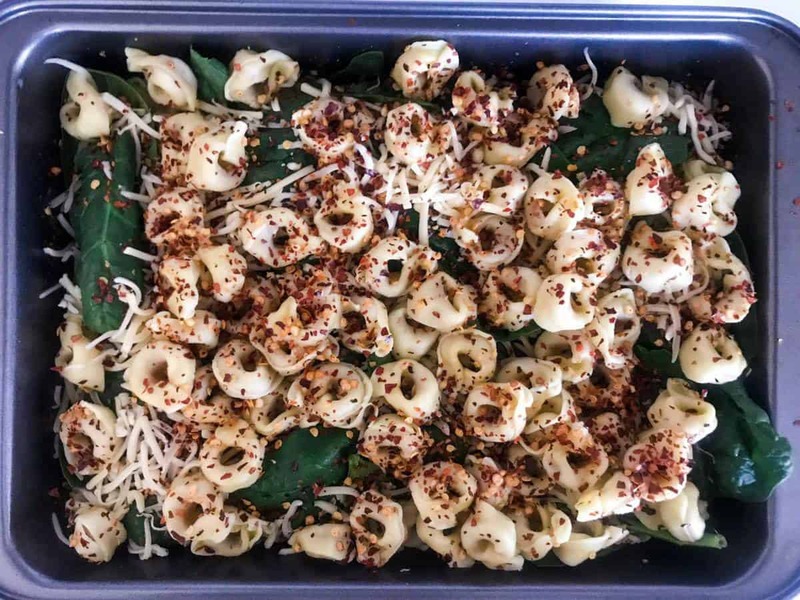 And about 15 minutes later you’ll have this beautiful baked tortellini casserole all ready to go. 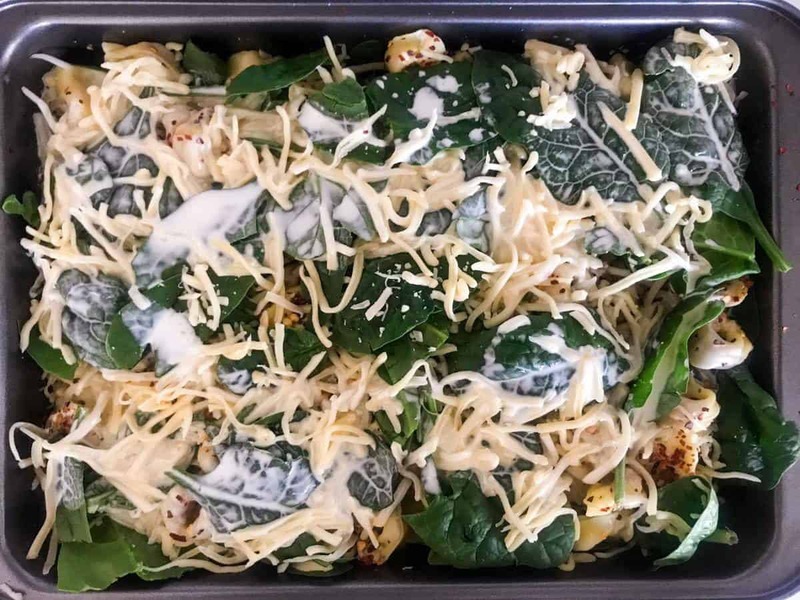 Often I just eat my tortellini casserole as it is, I mean you do have a nice helping of spinach in there so that’s technically salad (or something like that). But it does go really well with a separate salad as well – tomatoes, cucumbers and peppers with a basic vinaigrette would sit nicely. And if what you’re really wondering is which wine to choose – go for something with its own hint of pepperiness, like a Syrah, Tempranillo or Pinot Noir. If going for white, go a bit sweet – it balances the spiciness nicely. Set oven for 200 C/400 F.
Cook the dried tortellini for half as long as stated on the package and drain. 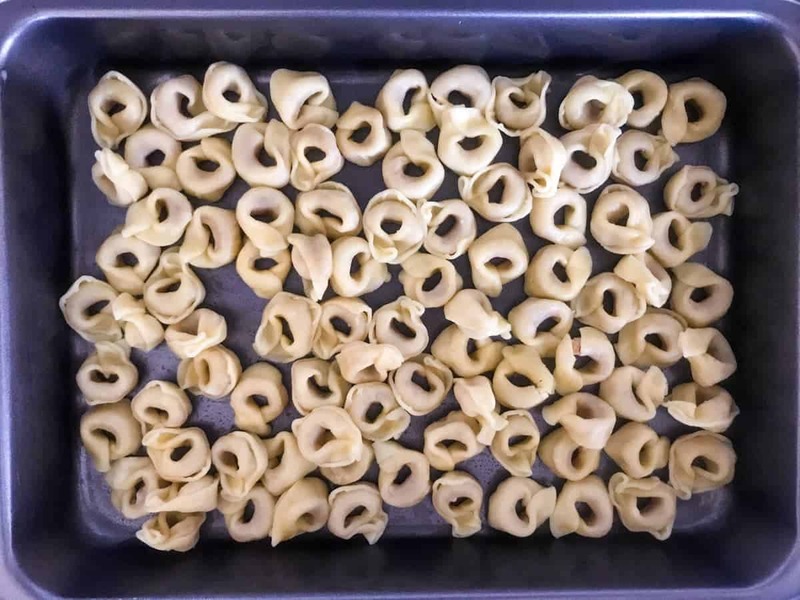 Place half of the tortellini in an oven pan measuring about 20x30cm/8x11''. 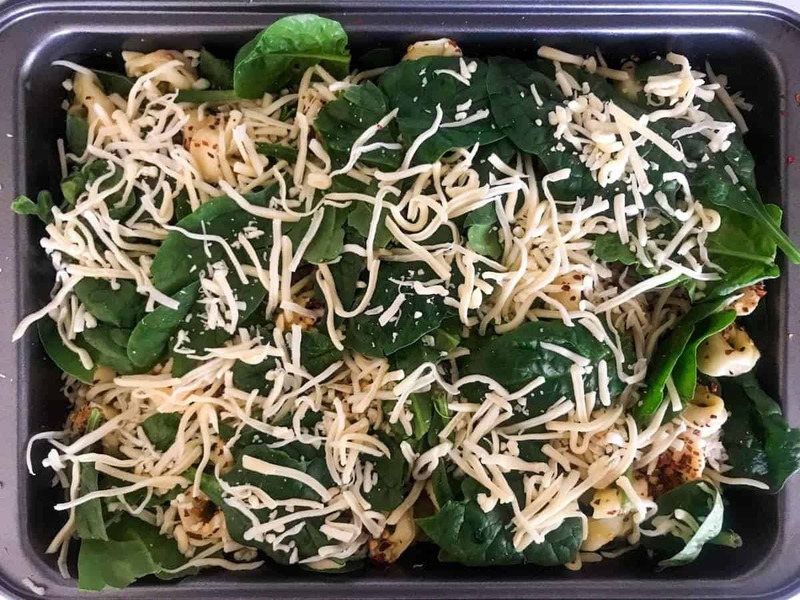 On top of the tortellini, place half of the spinach followed by half of the cheese. 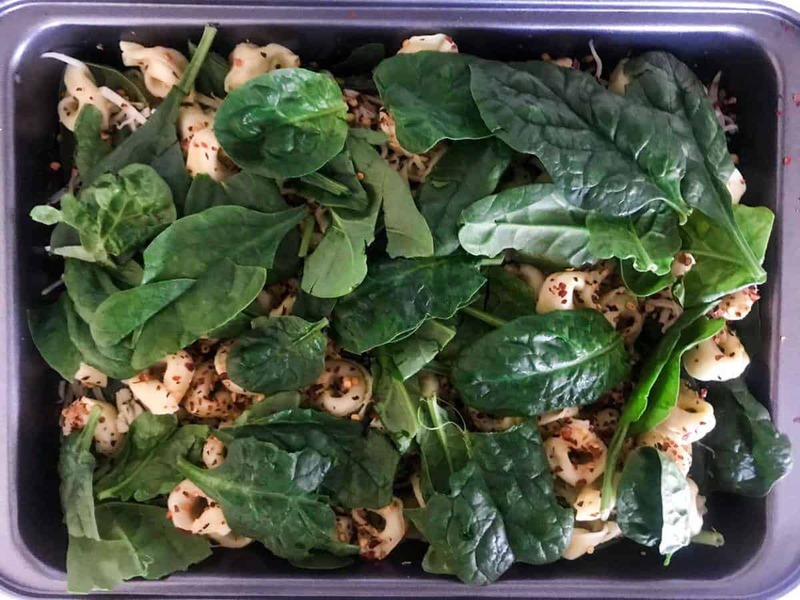 Add the rest of the tortellini, sprinkle with the chili flakes, and follow with the rest of the spinach and cheese. Pour over the cream, and try to spread it out as much as possible. 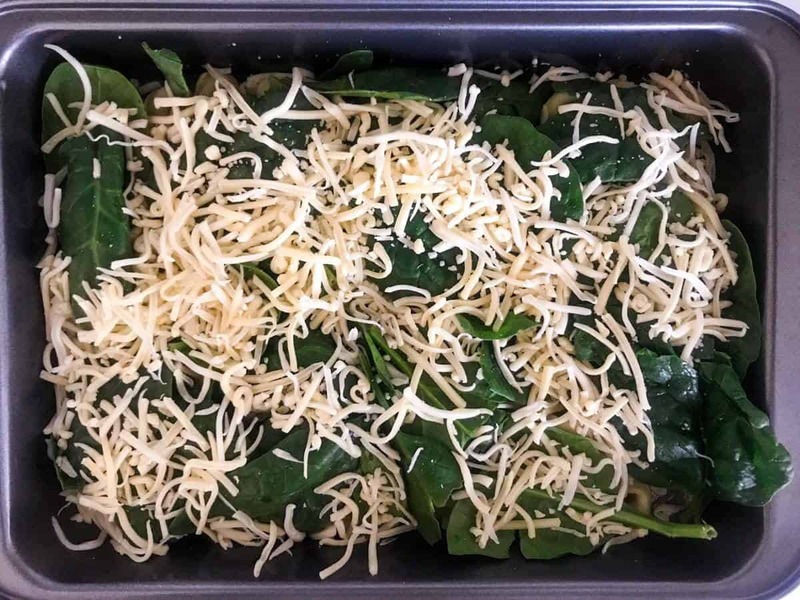 Bake in the middle of the oven for 15 minutes or until cheese is melted and slightly golden and the casserole seems mostly set. Serve as it is or with a salad. 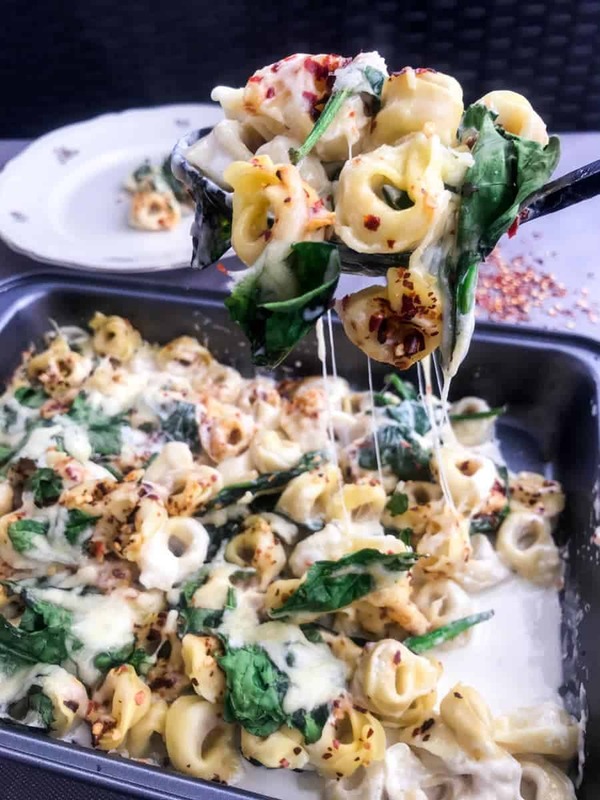 Make ahead: Cut the tortellini cooking time by one more minute so it won't overcook when heating up. Not into spice? Use another seasoning of your choice. What a tasty looking dish! My family would absolutely love this and it takes such a short time to make! Definitely giving this a go. I love pasta and tortellini is one of my family favorites. We make them several times a year. These sound great baked! Love this flavorful meal! Can’t wait to whip it up this weekend! 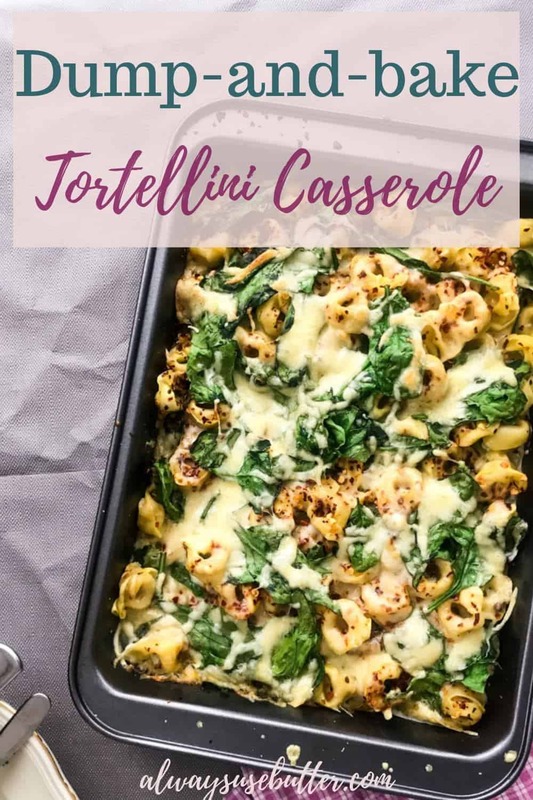 What a great idea using tortellini! I bet it tastes amazing! I love adding spinach to so many things. My 7 year old is a noodle addict and I bet he would absolutely love this. Same here! Such an easy way to get some extra greens in there. wow.. yum yum. I like the fact that you add nutritional facts..
Love this!!! Let me know what you think! The pictures and step by step instructions are amazing. This looks delicious and so easy to make. I think I’m going to have to try it. Never thought to do the dry pasta. Thank you! 😍 let me know when you try it, hope you’ll enjoy! Thanks for the tip to cook the tortellini a little less as to not overcook after heating it up. Sounds great. I am a meat eater so I think this will go great with some chicken breast as well. Yeessss that’s a great idea! Will have to try it for myself. Thanks for commenting! Mm! I’m vegan but def will try a vegan substitute of this. Thanks for sharing! The dish looks tasty and great texture for it’s creamy. I give a perfect score for this recipe, you’ve given this a great twist and very unique style of ingredients. This is one of my faves. We had ravioli tonight but I almost decided on tortellini instead. This looks damn delicious! I love trying new recipes. Will surely make this soon. That’s a good reaction! 😉 thanks for commenting! I’ll have to play around with making a vegan version of this. It sounds like it would be a fun one to make! Let me know if you find a good version! Would love to make a vegan version as well! Can I just tell you I can taste it just looking at the incredible pictures! Yum! This is an inspiring dish that I think I can tackle and my whole family will love. This looks simple and delicious! Great for family gatherings. Nothing compares to a warm meal at home. Thank you, Lisa! Agreed, an easy warm meal is just so nice.